Today Palicte travelled to Costa Mesa, California to meet Mr. Abbas Ahmadi, and the employees of South Coast Mitsubishi to pose for photos to help hype the fight, draw people to the dealership, and trumpet the South Coast Mistsubishi brand. Mr. Ahmadi is the Chief Executive Officer (CEO) of South Coast Mitsubishi. Palicte’s new sponsor, South Coast Mitsubishi is part of the Mitsubishi Super Stores, but it is still a local family-owned dealership. They pride themselves on providing unparalleled customer service to all of their customers. All of their vehicles come fully detailed, and they provide a free car wash with every service because they are looking out for their customers. From Costa Mesa, they serve all the surrounding areas too including Fountain Valley, Irvine, Huntington Beach, Mission Viejo, Anaheim, Buena Park, and more. They also deal with previously owned cars making car shopping at their dealership a great experience. South Coast Mistsubishi is known for sponsoring many fighters, notably Manny Pacquiao. 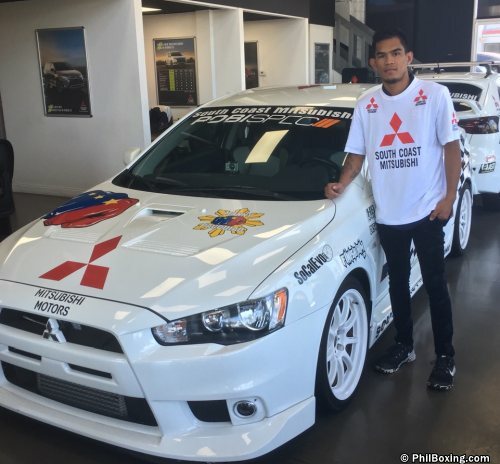 In fact it is not uncommon to see members of Team Pacquiao running around town sporting the Mitshubishi t-shirts adorned with the clenched fist logo of Pacquiao. 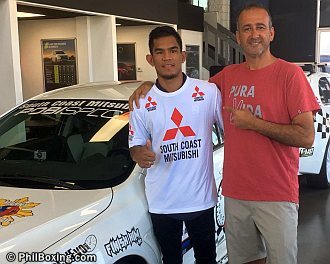 Aston Palicte poses with a Mitsubishi car bearing Pacquiao's logo and with Mitshubishi South Coast dealership CEO Abbas Ahmadi (top photo). Another famous boxing personality often seen wearing Mitsubishi outfit is Robert Garcia, one of Southern California’s better-known trainers. He trained his brother Mikey Garcia, the current WBC World Lightweight Champion. Aston Palicte, (24-2-0, 20KO) battles his province-mate, Donnie Nietes, (41-1-4, 23) early next month. Nietes held the record of being the longest reigning Filipino world champion, surpassing the famed record of Filipino great, Gabriel “Flash” Elorde. The Nietes vs. Palicte fight is only the second time that two Filipino warriors will fight for a world title in a foreign land. The first one was between Jerwin Ancajas and Jonas Sultan held early this year at Fresno, California. Palicte is fighting for his first world tile. He laments the fact that he has to battle a fellow Filipino to win his first world title but accepts it as part of professional boxing. The Nietes-Palicte fight is the main supporting undercard in an event put up by Tom Loeffler’s 360 Promotions set on September 8, 2018 at the Fabulous Forum at Inglewood, California. Fighting in the main event will be two Mexican warriors, Juan Francisco Estrada of Hermosillo, Sonora, Mexico (36-3-0,25 KO) versus Juan Orucuta of Nicolas Romero, Mexico (36-4-0, 30KO). The fight will be shown live on HBO.